Redcaps are fey(faries) that are famous for their bloodlust. A Red Cap or Redcap, also known as a powrie or dunter, is a type of malevolent murderous dwarf, goblin, elf or fairy found in Border Folklore. They are said to inhabit ruined castles found along the border between England and Scotland. Redcaps are said to murder travelers who stray into their homes and dye their hats with their victims' blood (from which they get their name). Redcaps must kill regularly, for if the blood staining their hats dries out, they die. Redcaps are very fast in spite of the heavy iron pikes they wield and the iron-shod boots they wear. Outrunning a redcap is supposedly impossible. as I thought the screenplay and movie where two completely different beastys. the screenplay offered a scene at Pandoras the local occult store that gave a lot more info on "the traditions" and what exactly Sam is. we meet a set of different trick or treaters then the one's in the school bus massacre and what sounded like a hella cool graveyard instead of the rock quay. its a bit lighter of the language and mindless murder. it had more to it then the movie but then again it would have been a lot longer and more expensive and Hollywood hates that. I would love to see the extra story in the graveyard one day but I think the schoolbus was a bit better. when someone says undead two things come to most people's minds. beautiful immortal vampires or hungry rotting zombies. but the walking dead come in tons of other shapes and sizes. Revenants are solid ghosts of western European myth. often they look like they did in life, a little paler and a bit on the thin side. sometimes they sport the wound that killed them, sometimes they take a bit more devilish form. they are always cold to the touch and the air around them seems to chill. they do not breath nor do they eat or sleep. Revenants are usually someone who was wronged in life and has come back for revenge. sometimes they did not finish a task and cannot rest yet. ether way most revenants have one task they have returned to do and once finished they while return to the grave from which they came. they can only come out in the dead of night to do whatever task they must. using all sorts of tricks from poison breath to nightmares to extract their revenge. they show the normal weakness of most English undead such as a fear of church bells and running water. a rather unique weakness is the paralyzing fear of a rosters call. every halloween nut and horror movie nut had been waiting since 300 to see this. two long years. and I'm sure most thought it well worth the wait. I had gotten a copy on my birthday from my girlfriend and had to wait until I was alone watch it. she's a bit squeamish when it comes to blood and gore. I was a bit disappointed in it. flash two months forward I deiced to re-watch it again to review it for Monday (yes its 5 days late. sorry!). and found my first opinion on it a bit tough. It is one of the best movies in a while, great story, great humor, and amazing ambient setting all making it stand out. which got me thinking "why was I so harsh on it before?" the answer was simple. like a whole lot of other October people after two years of waiting we where all hoping for the holly grail of Halloween movies. and it is not. while being awesome the film did have its problems. by the end of it, it seemed that people where getting killed for the sake of dying. the language might have been better toned down a bit. the movie tries for to much shock value and not enough creepy. I downloaded the script to read it and see if this was the writer or Hollywood's fault. Sam is the critter I have the most mixed feelings about. his little burlap sack mask and over sized bag is uber creepy and he is a well built monster. however his "Demon form" is kinda too corny looking and I would have liked him to keep his mask on. also he has some really awesome moments, then others he feels like a bad slasher who failed victims 101. The master of the graveyard, keeper of the secret to making zombies, and voodoo grim reaper. 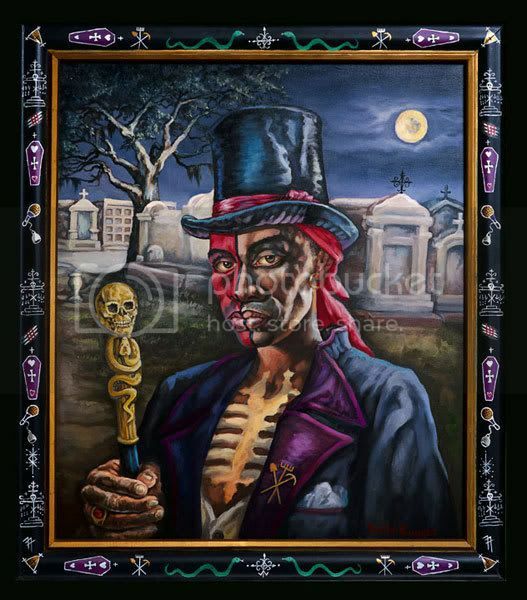 this loa (voodoo god) he dresses in a top hat, sunglasses with one lense missing,and a fancy tux coat. one half of him is ether painted up like a skeleton or is half skeleton. 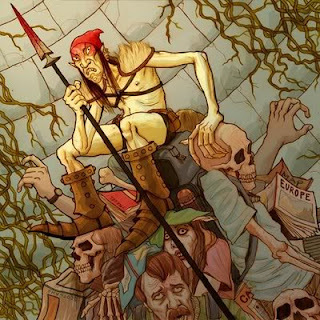 as far as gods of death go the baron is unique in his sociability and charisma. often going to partys and balls. he is rude and rambunctious but in pleasant way. ironically as a god of death he is the life of the party. he has always been a favorite of mine because he adds a bit of spice to your normal reaper. even though he was a party animal. he took his job very seriously and is one of the most called upon loas because of this. you would ask for his aid with helping a dying person. they could not die if he would not take them. most books involving Halloween are a disappointment and whenever I start one I don't expect much. I was pleasantly surprised by this book. It was not only an okay book but it went above and beyond what I was hoping for. witty, exciting, and full of halloweeny goodness. the story starts in Victorian London on the first of October. our main character the, knife cursed Jack, and our narrator and jacks pet the watchdog scruff. they are players in game that determines the fate of the world. mixing in a little cuthul myth this game is a occult contest between "openers" who wish to let the elder gods into the world and "closers" who want to stop them from coming. 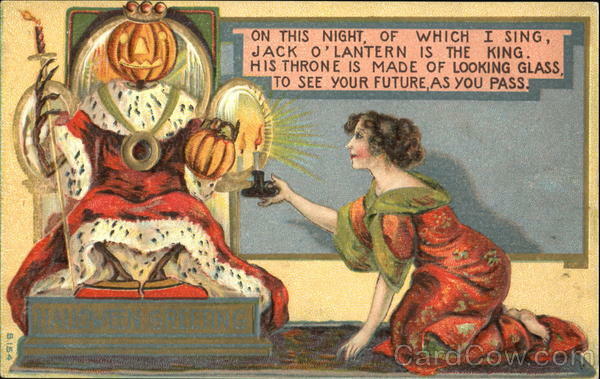 it only takes place on a Halloween with a full moon. other players include werewolves, Dracula, Frankenstein and his monster, mad clergymen and a witch. this is all and all a fun and refreshing book worthy of a read and a great way to get into the spirt of Halloween. 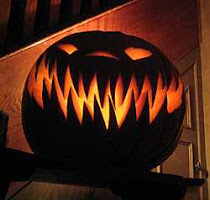 Welcome to The land of always October.This is a blog that is dedicated to darkest holiday of the year, Halloween. I'm going to try and post at least three times a week, but life is busy and unpredictable so no promises. Monday is spooky review day, where I show you some cool books, movies,music, and games. Wednesday is creepy mythology day, where we see some of the scariest gods, monsters and tales throughout history and folklore. the rest of the week is free to whatever I decide.